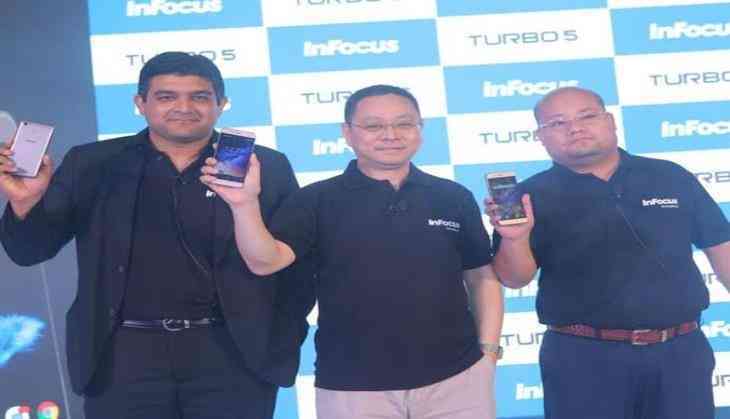 Aiming to bounce back into the smartphone segment market in India, InFocus on Wednesday unveiled its latest device 'Turbo5' at Rs. 6,999 for the 16GB version and Rs. 7,999 for the 32GB version respectively. Powered by InFocus' new strategic partnership with Foxconn, the device is built-in with a powerful 5000mAH battery with a 1.3 GHz Quad core processor. The phone comes into two variants-one with 2GB RAM and 16GB ROM, and the other with 3GB RAM and 32GB ROM. The device currently supports Android Nougat 7.0 OS. Supporting fingerprint sensor that not only unlocks the device but also works as a power-up button for the flashlight and click images, the phone's sensor has the capacity to register five fingerprints and unlocks the device in 0.5 seconds. The 4G-enabled Smartphone boasts of a 5.2 inch HD IPS 2.5D glass display that offers a crystal-clear image. Catering to selfie lovers, the phone comes with a 13MP rear camera and a 5MP front camera with 2.2 aperture. "If there is one thing that sets us apart from the crowd, it is the battery capacity of this phone which is being made available at such an aggressive price range. No phone is available in the Rs. 8, 000 price range that not only supports a 5000 mAH battery, but also works as a power bank,"Piyush Puri, VP-India and South Asia for innicom Electronics India Pvt. Ltd. told ANI. In line with the 'Make in India' initiative, the company has set up their manufacturing hub at Noida, with over 95 percent of the production line taking place there. "Turbo 5 focuses on the real consumer needs; which is for a device to last all day and some more, this device takes the rigors of multitasking and lets you sail through the day with ease. Going ahead, we will continue to expand our product portfolio and introduce innovative and disruptive 4G smartphones for the Indian consumers. For this FY InFocus plans to introduce 16 new products, aiming to reach six million volumes by the end of the year," said Dr. Luo Zhongsheng, Global CEO for Sharp and InFocus Mobile. Available in two colour variants including Pure Gold and Mocha Gold, the smartphone will be available for sale exclusively on Amazon starting 4 July.